:: For His Grace, Mercy, and constant Love. I've been a mess this past week and there's nothing like a Father who just wants me to know that I am loved despite my craziness. ::For His Mother, our Lady. ::My Husband. He is kind and patient and constantly showing me that I am loved - despite my craziness. He reminds me that I need to get some sleep and that my craziness is for lack of sleep which helps me feel slightly less crazy. He listens to me and holds me. He sits with me and knows me. These are all good things. ::For two beautiful boys. They teach me about Joy, Wonder, and Awe on a daily basis. ::For new days. Today is a new day. A new start. A new beginning. :The St. Therese of Liseuxe Novena. We're on Day 2. Such a sweet Saint that encouraged all to find love in little places. Little to-do's. Little ways. She is so dear to my mama heart because all the things that I do seem so little in the grand scheme of it all. We mama's do so many little things everyday. Join in the Novena here! Jesus does not so much look at the greatness of our actions, nor even at their difficulty, but at the love with which we do them. ::For my Uncle who lost his brother. ::The gift of woman. Typically when I start to struggle with something, I seek out the root - or try to - of who I am in the eyes of my Lord. All of this pondering has brought me to pondering the gift of woman, the gift of us in our femininity. Of motherhood, both spiritual and physical. How irreplaceable we are in a society that seems to think we are replaceable or not set apart from our male counterparts. A society that tells us in order to be considered successful we must do so in terms of men and what success looks like on them. We have our own feminine genius and it is beautiful. ::A loving home as best I can. ::a lot. Everyday. Slowly but surely. He is honing me. Meanwhile, I'm trying not to fight Him on it. To say my Fiat and to say it Joyfully. We're having this Balsamic Crockpot Chicken tonight on whole wheat tortillas and salad with some ranch dressing. Also, having a veggie along with these yummy potatoes from Pioneer Woman (note: the potatoes are amazing!!!). My tastebuds are thrilled. A dress I got from Target a few years ago. So comfy and nurse friendly. ::I found this fun Scarf Swap idea from my friend Britt. Britt blogged about it here. Hope to join next year! ::Katrina over at Cedars and Tiny Flowers wrote a post that I could have written today or everyday these past few weeks. Finding new blogs to follow is so fun. I'm still learning the ins and outs of the blogging community but there are just so many wonderful women sharing their faith, lives, and families out there! It's a community that definitely is nourishing for this mama's heart. ::This beautiful post about Love coming first. ::This post about loving your post-partum body. Baby steps in that realm going on over here. ::And this incredibly beautiful post about having it all. Here words were whimsical and beautiful and oh-so-very-true. In fact, after this post I'm going to make sure I read it again. ::Fall. Fall weather. Fall clothes. Fall colors. Fall foods. Fall holidays. Fall feast days. Fall Smells! Fall everything! ::Everything that comes out of Bigfoot's mouth. ::& that Linus has been saying Mama with more intentionality since yesterday. ::I'm breathing in and breathing out. I'm going to try and be beautiful and lovely and all things feminine. I'm going to try and be diligent, encouraging, and supportive. 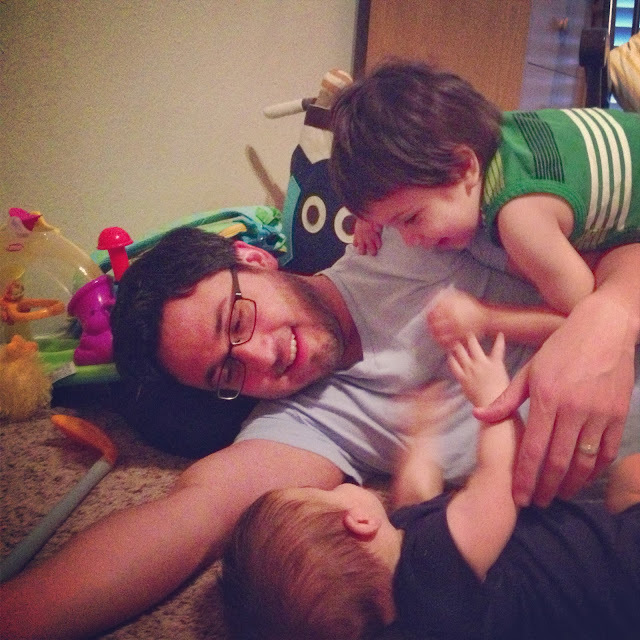 I'm going to enjoy my boys and love their father. I'm going to stick to the basics till I start getting a better hang of sleep (I think we're getting there, which is exciting!). My heart. This was a few nights ago. I love these three! I also love Jessica from Good Cheap Eats. I love this picture. Such joy and love in their faces for one another. I love seeing that in my house with my boys. I joined a Jesse Tree advent swap where I have to make 32 little ornament ladders! I can't wait to see what I get back! Swaps are really fun.